Step 1: Use a butter knife to split the walnuts in half – place the tip of the knife on the top seam and carefully wedge it in and twist to separate. (Note: I found some walnuts were no problem but others were impossible to split evenly. Be sure to buy more walnuts than you need in case some crack unevenly.) Empty out the insides and keep track of which halves fit together. Step 2: Paint black the exterior of all the walnut halves. Let dry. Step 4: Use the white pencil crayon to draw an eye on the face and feather details on the tail and wing. Step 5: Hot glue the head and tail onto one half of the walnut – the head goes onto the smaller end and the tail on the fatter end. Step 6: Use more hot glue to attach the other half onto the walnut. Step 7: Hot glue the wing onto the side. Step 8: Use the needle nose pliers to bend pieces of wire into legs/feet for each turkey. The legs shouldn’t stand taller than 3/4″. Step 9: Hot glue the legs to the underside of the turkey, bending the wire between the legs to fit the curve of the walnut. 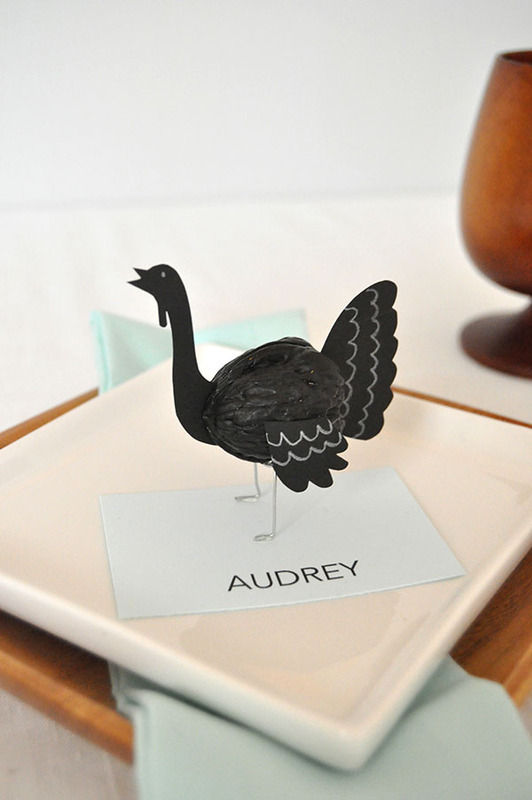 Step 10: Print and cut out the names of your guests onto the blue card stock. 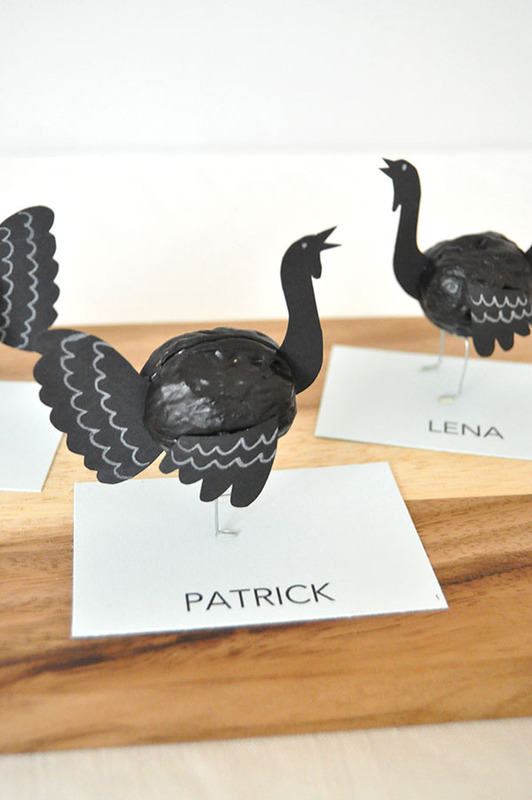 Step 11: Hot glue the turkeys feet onto the card. Really amazing! Love them. Check the template link again, it takes me to another post unrelated. Ok these are amazing!!! However I don’t see a template – just a link to pictures of turkeys – is there a template? I am not capable of drawing them myself – LOL! Adorable! The black was a smart color choice. OMG ! This is really nice ! where do you get all this ideas? big like ! Keep it up ! kathleen!! you turkey-walnut-lovin’ genius, you! love these hilarious little guys. such a fun idea. These are adorable! 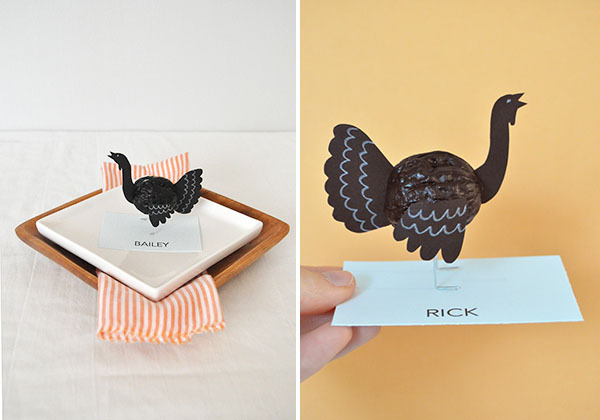 These would be fun to do with kids on a T is for Turkey lesson. These are hysterical! 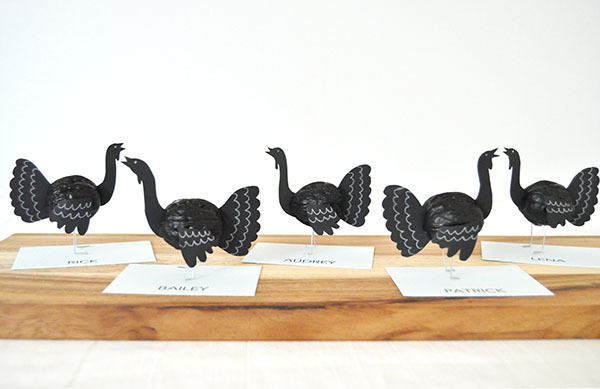 Hoping to make them to take to my parents to bring some fun to the Thanksgiving table! Love them!